Lonnie Wheatley, TULSA, Okla. (January 13, 2015) – It was both savage and a thing of beauty at the same time. The opening feature of the 30th Annual Lucas Oil Chili Bowl Nationals at Tulsa Expo Raceway on Tuesday night offered merciless sliders, precarious exams of the cushion that sent front wheels skittering all directions in the fight for command and a hair-raising (at least for those not too follicly-challenged) battle for the lead. Ultimately, Alex Bright from the always festive-sounding locale of Collegeville, PA, took command at the midway point and then fought off a host of beyond serious challenges before nipping the late-surging Joey Saldana at the line by just 0.144-seconds in a virtual photo finish. 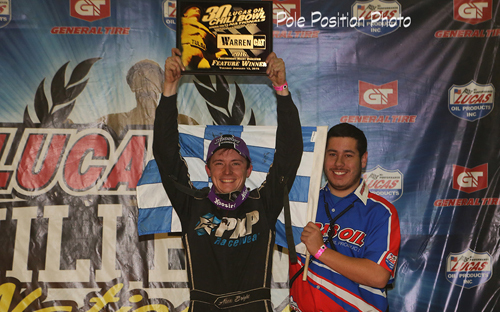 “This is absolutely amazing,” Bright said after the hard-fought 25-lap victory atop the ¼-mile indoor clay oval. While Bright ultimately celebrated on the big stage before all the flashbulbs after starting eighth, it was NASCAR star Kyle Larson in firm command from the pole position in the early stages. With Larson out front early on, Bright was on the move by making his way to fourth by the eighth round and then making his way past Zach Daum and Jonathan Beason to climb to second by the tenth circuit. While it looked like a Larson runaway early on, Bright made it apparent that may not be the case as he was gobbling up the real estate on the top side and poised to challenge. Before he could make the move though, the about-to-be-lapped car of Cameron Hagin spun in turn two directly in front of the leader and collected Larson. With Larson relegated to the tail of the field, Bright assumed command and the battle was on. And it didn’t cease until the checkered flag flew. First, Daum slid by on the restart and briefly surged ahead. Bright had the answer and reclaimed the lead. Beason took some shots at the lead as well, only to have Bright counter brilliantly to maintain the top spot. When sliders weren’t being thrown at Bright, the trio of Daum, Beason and Spencer Bayston mixed it up right on his tailtank with Kevin Thomas, Jr., itching to get into the scruffle. Thomas, Jr., or “KT” as it is, got caught up in a cushion jump from one of those just ahead after 14 laps, and Bayston’s spectacular bids for the point ultimately were derailed with a failed battle with the turn four cushion that resulted in a spin with just three laps to go. Three laps to go. And there’s that blue No. 17 that had started back in 11th. 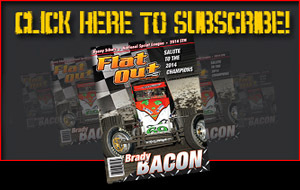 Joey Saldana had quietly, make that extremely quietly, made his way into the fray. Just seventh after a lap 21 Darren Hagen turnover in turn four, Saldana was sneaking by on the low side while all the others waged war up top. And making it work, getting up to fourth after the final caution for Bayston set up the three-lap dash to the stripe. The final three laps were frenzied, with Bright brilliantly countering every slider that Daum and Beason could offer up and then nipping the surging Saldana at the stripe by the very narrowest of margins. “It got really crazy there, I knew I just needed to stay calm and it would work out,” an enthused Bright said afterward. Daum captured the third and final lock-in to Saturday night’s 55-lap Chili Bowl finale behind Bright and Saldana with Beason and 16th-starter R.J. Johnson rounding out the top five. The feverish 30-lapper capped a night that already included the latest VIROC Round in which Tanner Thorson successfully denied the late challenges of a determined Kyle Larson to take the win with heated battles throughout the pack in their wake. 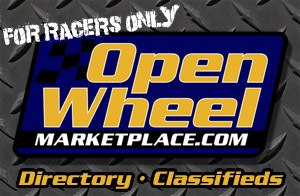 For complete results from Chili Bowl Night One, go to http://www.chilibowl.com/news/?i=35424&clk=featureNews.